History: (Captain America I#419)- The Fangs were dispatched to rescue the Viper from the Iron Monger, who was torturing her for information on her latest scheme on behalf of the Red Skull. The Fangs opened fire on the Iron Monger and killed him, then brought the Viper back to her broadcast station so that she could put her plan into motion. As the Viper prepared to unleash a blinding flash upon all television viewers in America, Captain America, Battlestar and Silver Sable invaded their base. 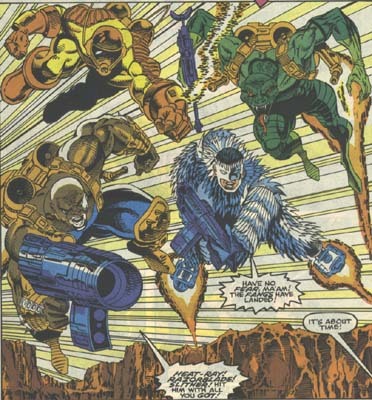 The Fangs set out to oppose them, but Slither was easily beaten by Silver Sable, and Heat-Ray, Bludgeon and Razorblade were each taken out in friendly fire. Captain America then used Bludgeon's gun to shoot down the Viper's broadcast tower, ending her scheme. Comments: Created by Mark Gruenwald, Rik Levins and Danny Bulanadi.